Inuyasha characters and Naruto characters. All in the same chatroom chatting with each other, where will this lead to? Summary: There are some things that we're forced to forget. But when presented with the means to remember a love she wasn't aware she'd had, will Kagome brave the unknown or remain blissfully unaware? The daughter of Inuyasha and Kagome has a fate dealt to her by the Kami themselves. What is her fate you may ask oh nothing really. Its quite simple. Just save the world from all of the evil out there, meet her soul mate and wind up together plus bring multiple factions of potential allies together to help in the final battle before the destruction of the known universe. Can she do it in time? Will it be easy for her? Or will unexpected challenges become too great for her to handle. Read more to find out. Inuyasha x Lilo and Stitch Crossover. After unintentionally hitching a ride to Feudal Era Japan, Stitch finds friendship with the brothers Sesshomaru and Inuyasha. But when Naraku learns of this indestructable new demon, he sets out for a sample of Stitch's DNA to make one of his own! While Stitch battles his evil Demonic clone, can he also help mend Inuyasha & Sesshomaru's broken family? It's Demons VS. Aliens in this action-packed humor story that teaches us that when it comes to O'Hana; Nobody Gets Left Behind...Or Forgotten! A girl finds herself in the midst of a battle, the likes of which she's never seen. What is this mysterious world she's stumbled upon? Who is this undeniably attractive man who she has an inexplicable need to protect? And just who is she? "The ground seems to speak. Trees dance to the flicks of the wind-baton. The People of the Sun hand out their beckonings only to those who desire them." Takeshi Yoshida was just curious. "Magical" shiitake mushrooms, a powerful concoction, a girl dressed in a school uniform, a clueless cult, and the boy who acts as a conduit in between the worlds he knows and the worlds beyond. this letter regards everyone. when i say everyone i mean everyone! see someone has made shows and books about everyone there. and i've noticed that all of ya'll need therapy. so i want everyone to come to anime therapy tommorow so everyone can work out there 'issues'. Summary: Death Note xover. Raito’s thoughts caused his outlook on life. The effect of his attitude allowed him to be able to use the death note. The effect of his death note was a great impact on society. But what caused his thoughts of boredom to spur his actions? Or, better yet, who? Summary: Hermione is not who everyone thinks she is. Harry has been gone for a year after the war. Then he comes back to bring Sesshomaru with him. Will Hermione go with Sess? Summary: Kagome and InuYasha finds two kids hiding in a bush by the temple but it looks they found some pretty strange kids. Summary: This is just a random plot bunny that i couldn't get out of my head no matter how hard i tried, so i decided to write it. It may be a little of a mary-sue, although i'm gonna try and keep it from becoming one. "Naraku has stolen something very precious from my shop, and the weight of that theft is upon him. I want you To find him, and get it back." "There is no such thing as coincidence, there is only Hitsuzen. meaning a preordained event of witch other oucomes would apper under differnt cercumstances." 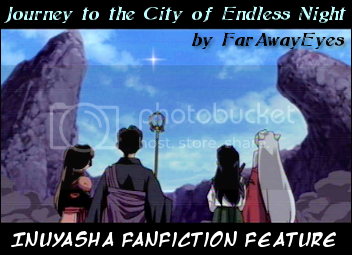 Slight xxxHOLiCxInuyasha but mostly D.Gray-ManxInuyasha pairing's are still undecided. Summary: YYHIY crossover! There is chaos in the Demon world. Factions are forming to take over the human world. The Yu Yu Hakusho gang,Kagome,Sesshomaru, and some of their allies must stop them. KuramaxKagome! IY/TB xover.The past is fated to repeat itself, never ending, rarely changing and always leading to heartbreak. However when the chance comes to right the wrongs of the past, embrace the opportunity, and never look back. Abel Nightroad/Kagome/Tres Iqus. Summary: what if some how sounga got out of hell and is looking for someone to possess. but it's not sesshomaru or inuyasha. i'm not good a summarys so just read the story.